“I am well aware that centuries of entitlement to women’s bodies whether they like it or not is not going to change overnight. This International Women’s Day – and every other day of the year – I would love to bake a cake for Emma Thompson. Allow me to explain my reasons for you. Emma Thompson has always been in my conscious for a couple of reasons; firstly, she has starred in the kind of films that I have always enjoyed watching with my Mother (Shakespeare, Austen, smart British stuff) and secondly, she was married to Kenneth Branagh on whom my Mother had a crush. I’ve always admired Emma Thompson as an incredibly intelligent woman and a talented actress. Not only is she an Academy Award winner for Best Actress but also for Adapted Screenplay for her adaptation of Jane Austen’s Sense and Sensibility (Ang Lee, 1995). There is nothing that I do not admire and respect in a woman who has the talent to bring Austen’s words to the screen AND to write herself a cracking monologue worthy of another OSCAR nomination – she really was nominated for that too! Yes, I have been a fan of Emma Thompson’s for many years now. This year, she became my hero. Hollywood has been a bit of a quivering mess in the wake of the #MeToo and #TimesUp movements. Huge names previously thought to be untouchable, above all reproach, the sort of names you had to put up with or shut up about, are now persona non grata. Careers built upon the pain and suffering of others came crashing down as victims spoke up and called their abusers out. The ‘casting couch’ has finally been either ethically up-cycled or sent to landfill… or has it? Has anything truly changed in Hollywood over the past year and half? I cannot say because I am not there. Emma Thompson IS there and she made a huge impact on the establishment of a new order in Hollywood this year. When Skydance Media, a huge player in Hollywood, hired John Lasseter to head up Skydance Animation, Emma Thompson left the project that she was working on with them in protest. Her reasoning was presented in a beautiful letter to Skydance explaining her position. She reasoned that, with so many outstanding claims of sexual misconduct against Lasseter, she could not be part of a project that he was heading up. Whilst we all hope that the kind of men who think that it is OK to touch co-workers inappropriately (or worse, or so much worse) can repent, be reformed, and rehabilitate into polite working society, we are not there yet. If a man with as many accusations against him as Lasseter is allowed simply to take a 6 month holiday and then score mega-bucks in a new position, what message is being sent to those women whose careers and lives he has ruined? I am not suggesting that we bring back hanging but a quick slap on the wrist and a pay rise is equally unacceptable. We then find ourselves in a funny old position. What do we do? 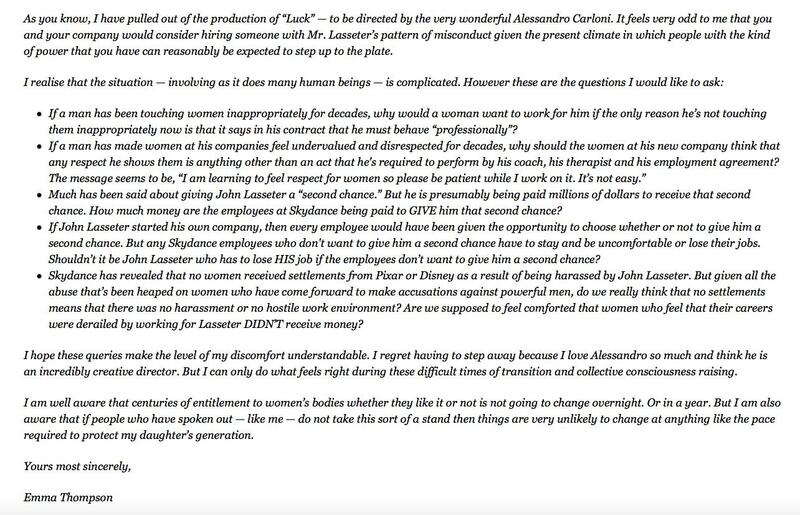 Emma Thompson’s response is so perfect because she has walked away and inconvenienced her employer, setting out her reasons in an eloquent fashion. We cannot all walk away from our jobs because we do not approve of our employers response to allegations – Emma Thompson can, and she did. 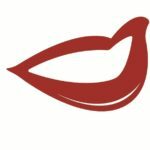 Of course this will impact upon her financially as she has walked away from paid work but she is in a position to afford to do so – so she did. Where we have women like Emma Thompson who are willing and able to take a stand, we will start to see change effected. When I found out that my employer was paying the one female director 50% less than the highest earning of four male directors, I could not afford to walk away from my job and I could not even speak up because I may have lost my job which I could not afford to do. I hated knowing this. I moaned about it to my family. I did nothing about it. I’m sure this resonates with some of you. You cannot do a damn thing about it. This was many years ago and I still think of it and moan about it often over wine. Where we have women like Emma Thompson who are willing and able to take a stand, we will start to see change effected. I know that I have repeated myself but it needed repeating. There will be the usual chorus of those who do not understand why International Women’s Day is required in 2019 – believe me, I ask myself this all of the time along with ‘why are there still racists and antisemites?’ – but this day is needed more than ever. If you think that we have gender equality now then I doff my feathered cap to you because you are having a lovely life. “Hollywood is definitely changing. #MeToo has been a wonderful moment of clarity. When I was a young woman, older men in the industry would constantly try it on. I was always able to say no, and they took that for an answer. This International Women’s Day, I am thankful for women like Emma Thompson who are prepared to speak out for the benefit of those women on lower rungs of the ladder. If I can do ANYTHING to improve the life and outlook of ONE woman who comes after me, then I shall be happy. If we can all do one thing to lift a sister up, we are onto a good thing. They say that empowered women empower women. I would love to bake a cake for Dame Emma Thompson and for all of my sisters today. Happy International Women’s Day. Oh, and in case you are wondering, International Men’s Day is on 19th November.